A dense and moist gluten-free brownie. Picking-up some sweets for a celebration is usually pretty straight forward. This time though, we had an extra challenge: accommodating a gluten allergy. While I must admit my knowledge of where to procure gluten-free products isn’t vast, having frequented Queen East lately brought one place to the top of the list: LPK’s Culinary Groove. While LPK’s offerings are not all gluten-free, there’s still quite a bit of choice to be had between the cakes, cookies, and chocolates. 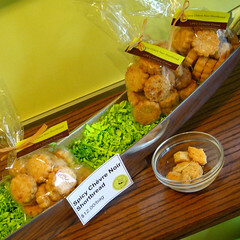 From this visit, we picked up the Gingersnaps, Shortbread, and an Almond Torte to bring to the party. I found both the gingersnaps and torte to be worth getting again, regardless of their gluten-free status. I was also lured into trying the brownie, as they had recently come out of the oven. Overwhelmingly sweet and chocolatey, it just was too heavy. It was also pretty costly at $5. The brownie was decent, but not for me. Spicy and cheesy - a must-try, even at $12. However, the favourite of the day was the Spicy Chèvre Noir Shortbread (sadly, not gluten-free). Really great flavour and very unique. Clocking in at $12 for a bag, this most certainly is for special-occasion moments – or your personal indulgence stash. Samples are usually on offer to help you shed your hesitation.